“The momentum that has been built up at AWS and Microsoft is particularly impressive." "Really strong" sequential growth at Amazon Web Services (AWS) propelled it to a five-year high in its share of the cloud infrastructure service market. According to new Q4 data from Synergy Research, 25% revenue growth from Q3 enabled AWS to grab a 30% worldwide market share in the final quarter of the year. Microsoft again achieved the highest year-on-year revenue growth, followed by Google, as all three cloud operators outperformed the total market growth and gained market share. IBM growth was broadly in line with the market so its overall market share held steady, while it continued to lead in the private & hybrid service segment. “Many actual or perceived barriers to cloud adoption have now been removed and the worldwide market is on a strong growth trajectory,” says John Dinsdale, a Chief Analyst and Research Director, Synergy Research Group. “The momentum that has been built up at AWS and Microsoft is particularly impressive. "They have an ever-broadening portfolio of services and they are also benefitting from a slowdown in the super-aggressive price competition that was a feature of the first half of 2014." For full-year 2014 AWS share of the worldwide market was 28%, followed by Microsoft (10%), IBM (7%), Google (5%), salesforce (4%) and Rackspace (3%). 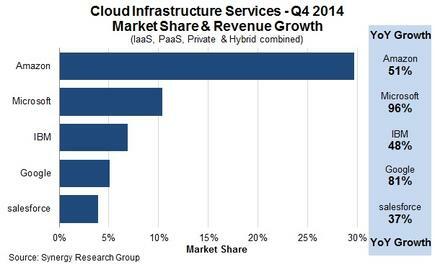 With most of the major operators having now released their earnings data for Q4, Synergy estimates that quarterly cloud infrastructure service revenues (including IaaS, PaaS and private and hybrid cloud) are now approaching the US$5 billion milestone, with trailing twelve-month revenues exceeding $16 billion. In addition, total 2014 revenues grew by 48% from the previous year.